On 26 March, an EJOLT delegation visited the headquarters of the European Environmental Agency (EEA) in Copenhagen to discuss possible avenues for collaboration. We explained our Atlas – they presented their work and we held a brainstorm on how both could benefit from each other. Among other advantages, it brings the activist-academic work done in EJOLT closer to the field of policymaking – as the EEA is the official EU Agency that provides data for environmental policymaking in the EU. Joan Martinez-Alier first presented a range of concepts that come from Environmental Justice Organisations since the 1980s, but have been recycled by academics, such environmental justice as used by the US civil rights movement (Bullard), sacrifice zones (Lerner), environmental racism (Chavis); ecological debt (Accion Ecologica), popular epidemiology (Brown), environmentalism of the poor (Agarwal and Narain), food sovereignty (Via Campesina), biopiracy (Mooney), climate justice (CCS-UKZN), water justice (Boelens) and Corporate accountability (Friends of the Earth). He added that “The Environmental Liability Directive helps to some extent to address the issues brought forward – but the implementation has room for improvement”. Beatriz Rodriguez then introduced the EJOLT project and the 13 reports published so far, with 6 Policy Briefs. 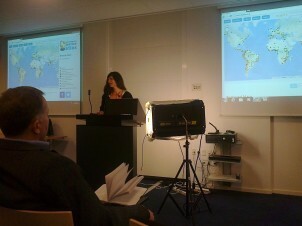 Leah Temper presented the Global Atlas of Environmental Conflicts launched in Brussels the week before. This Atlas contains about one thousand cases at present, of which 17% are classified as ‘success story’ – meaning they provide justice. They occur in a higher proportion in the global North. Another important remark was that the Atlas is not geographically representative yet. The EJOLT team explained that the Atlas is now like a medieval map with blank spots – but by launching it we are generating renewed interest in filling the gaps – for example for China and Indonesia. Much depends on activists or academics with knowledge that are willing to spend time in sharing the knowledge they have with us. This was the case with a small group of University of Michigan master students together with their Professor Paul Mohai (active in research on environmental justice since the 1980s) who were part of the delegation. They had filled out 40 database forms on environmental conflicts in the US for the EJOLT map. Paul Mohai had direct knowledge of the regulations and work done by the EPA in the US on environmental justice, and was curious about similar experiences in the EU. David Stanners then compared their work at the EEA with our work with EJOLT: “If you are bottom-up, we are top down.” The EEA collects data from national statistical institutes. It builds a knowledge base on many different environmental topics for supporting environmental policy. Although the EEA is an official body of the EU, its membership extends beyond the 28 EU countries, for instance to Turkey (which is so well represented in the EJOLT Atlas). The ensuing brainstorm involved staff from the EEA, EJOLT project coordinators and the team from Michigan University that collaborates with EJOLT. Issues of chemical pollution and its cumulative effects, and the monitoring of marine litter (with citizens’ participation) were discussed. One idea that came from the brainstorm is to compare maps where objective data show ‘environmentally vulnerable places’ (EEA data) with the citizens’ geography of environmental problems or environmental conflicts (EJOLT data). For this purpose, more data are needed on current environmental conflicts in the EU not yet collected by EJOLT. David Stanners rounded up the debate by sending the EJOLT team home with some questions: “We want to know what is needed for environmental justice. Which existing EU laws can be used, which court cases should we refer to and what are the barriers for making the Aarhus convention effective? Secondly, what will happen when the project ends in March 2015? Thirdly, he told us to ensure links and credibility with policymakers, and attune our work to the European policy cycle.